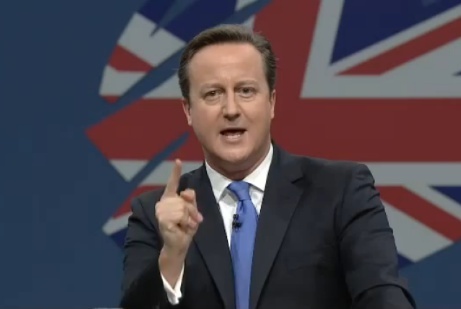 PRWeek sounded out the conference floor following Prime Minister David Cameron's speech this morning. David Cameron: "Land of hope is Tory"
In his Conservative Party Conference speech Cameron claimed that the "land of hope is Tory" and sought to portray Labour as offering "1970s style socialism". Though he did not unveil any new policies, the Prime Minister hinted at further reform of the welfare system, and said his party would be the one to "back business". The PM rallied his party at the end of a rather subdued and pensive conference. He has for the first time set out a very clear Tory platform for the 2015 election campaign. It is an agenda which the public may well like and want to support. The problem remains the PM. In many parts of the country he continues to have little if any political appeal. This is the major challenge facing Lynton Crosby. A recovering economy is not enough. The PM has to reconnect with Tory and Tory inclined voters. It was a safe speech with a lot of appeal to the centre ground. It was good that he didn’t put any gimmicks in, which would have been seen as an overreaction to Miliband. It’s always interesting to see the way that good politicians grow into the job of Prime Minister. In many ways the speech reminded me of Blair in 1999/2000. Extremely confident. Fantastic delivery. A very very strong narrative. The thing I really loved about the speech was the long-term feel of it, the way in which he’s looking 10 to 20 years ahead for the country and that is exactly what we should be doing to sort out the problems that he has inherited. The narrative is that when we create opportunity we need to ensure that everybody has a chance rather than just a few people having a chance. There was a very strong focus on education… the idea that we need to be creating a very highly skilled workforce in order to take on the world and ensure that we can grow out of the mess we’re in and pay off the bills. Not the best speech from Cameron. It was a steady as we go narrative, no big policy announcements, which the media hate. I don’t think he will get away with that in next year’s pre-election speech! I think it was an excellent speech. It had a lot of humour as well as some very good common sense points. I loved the film leading up to the speech, it had great humour in it. I like this idea about building for the future. I think the public will like that very much. A lot of good ideas for the future. If we can branch out and get the message out that the Conservative Party is actually for everybody, it’s for people who literally just want to do the best for themselves, get a house together, get a job, pay the bills and look after their family. I’m absolutely delighted that the family has been recognised by David Cameron recently. What he did brilliantly was to communicate optimism about what’s going to happen in the next two years and beyond. I thought the Thatcher quote he put in about how we need to plant trees for our children, the idea that we’re planting a seed so we need to put the policies in place not only to continue to turn around the economy but also to ensure we deliver for the next generation, was fantastic. The four young speakers before him were absolutely terrific: covering their own experience of free schools, apprenticeships, national citizen service and start-up loans. He also acknowledged social workers, the importance of family units and how we need to protect the most vulnerable. It was a really good platform of ideas on which to fight the next election. I was very happy with the speech – upbeat and optimistic. The speech was at a very important stage in Parliament where he’s saying so far our focus has been on cutting the deficit and getting the country back on track but we’re looking ahead now to the future saying what sort of society we want to create. Not just clearing up Labour’s mess but building a new more aspirational, more open society. It was fantastic. I particularly liked the part where he praised social workers.